Century Brass can expand from a brass quintet to a brass band that recreates the wonderful musical wealth of 19th century brass band for the edification and amusement of the modern audience. The group ranges in size from as few as five brass players to as many as ten brass and three percussion players. Brass bands have been important in Minnesota since the 1850s. The Great Western Band of St. Paul was active in Minnesota as early as 1858. Another early brass band was the St. Anthony band which in 1853 played for the grand opening of the suspension bridge over the Mississippi in St. Anthony. In 1861, the Red Wing brass band played as they sent Civil War volunteers to Fort Snelling--when those volunteers arrived, they were greeted by the Great Western Band of St. Paul. 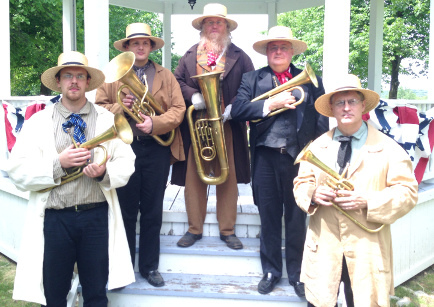 The Century Brass Band can provide live music to accompany 19th Century dances such as waltzes, polkas, schottisches, quick-steps, reels, quadrilles, and other dance styles popular in the 19th century. The Century Brass Band performs music from these sources.